I was there. He mesmerized me. I’d even say it changed my life. I could do anything. Be anything that I wanted to be. It was liberating. Today my man Bob Dylan received the Nobel Prize for literature. Well deserved Mr Tambourine Man, well deserved. I never met Dylan. But I still have an awesome story about how we came to ride the winds of time together. The year is 1966. I am just into my last semester as a fine arts student at what was then RPI, now VCU, located in Richmond, Virginia. A division of William & Mary, RPI was a campus cobbled together in the fan district, the part of town where streets fanned out from the centrally located departments stores and town churches to meet the suburbs. School was composed of maybe four actual classroom buildings to include a three story gym with the art department being housed on the third floor. All other classes were held where ever a spot could be found. Mostly carriage houses or old homes. Campus population was roughly half day students and half boarding, save a separate count of night school students who were mostly professionals adding onto their degrees. Those of us that lived on campus, found ourselves housed in former richly appointed homes. My dorm was the Bocock House on Franklin Street. I was one of its first inhabitants. Mrs Bocock had just opened the second floor of the front half of the house to the college. There were thirteen of us. By the time I graduated our numbers had increased to about twice that size since third floor rooms were added to the mix. My first room was a corner room (they were huge) and overlooked the formal garden. My second room had hand painted French wall paper that used to drive us insane after a night of drinking. Red, white & blue plumes that danced freely for you. This room was in the middle of the second floor rooms (all the rest were corner rooms) and was actually a sitting room and thus very small compared to the others. Each room had its own bathroom complete with European water closet and claw footed bathtub. We had walk in, and walk through to the adjoining room, closets. Our room had its own small balcony, very Juliet like. All of this narrative is to set the scene for RPI stories to follow in various posts. It was the sixties, women had curfews and were not allowed to wear pants on campus. I had to wear a raincoat over my bibs to and from art classes to avoid a call to the dean of women’s office. I later got one but that is another story and for another reason. The day of the Dylan concert I was hanging out at Andy’s on Grace Street, the favored watering hole of business students. I was told recently by a fellow student that art students just did not go to Andy’s. I really was not aware of this pecking order at the time. He explained that art students were not cool enough, or maybe too cool, but they gathered elsewhere. Since my roomie was a retailing major and I dated among her crowd I had a free pass to be among the elite. 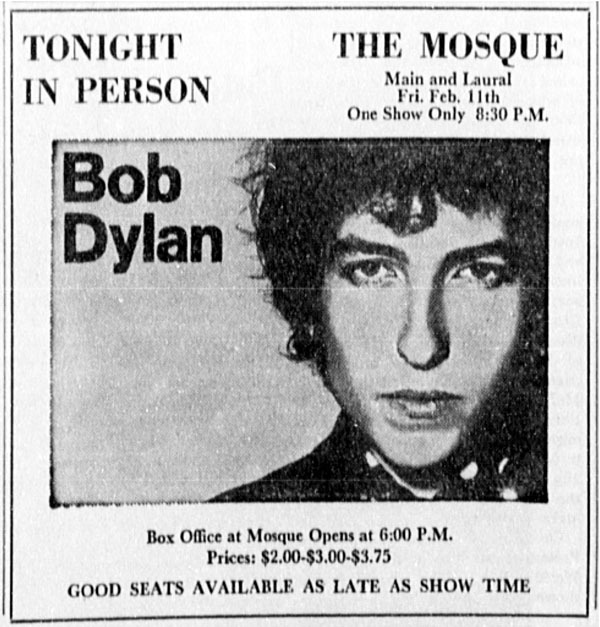 It was there that my drinking buddy (his gal pal was at home in Georgia birthing their college romance son, no pregnant gals allowed on campus in the sixties) said he had free tickets compliments of a friend that worked in the box office of the Mosque to a nifty concert and would I like to go. He promised it would rock my world. The Mosque was close to campus and appears as it sounds, very big, very ornate and very impressive. All campus dances were held in the lower level ballroom. Another story. I accept his proposal and we part to prep for our date. When he picked me up, he tells me we can get better tickets than the balcony ones he has. We stop at the box office and trade our second balcony tickets in for front row, first balcony. He explains who I am about to see. I know a little about Dylan. A dorm mate had some of his albums, I thought them rough. The house is not packed and at that it is mostly older folks, I did not see anyone from campus. What kind of concert is this going to be? Then this skinny guy walks out on the stage of this massive place with its elegant side box seats, ornately domed ceiling and layers of velvet curtains. He sits down in a straight back chair set center stage. That’s it. Well, okay a mic, on a stand. But nothing else on that huge stage. Just the man, the guitar, the chair and the mic. He warms up for a minute, probably even smoking a cigarette. And then it begins. I fall in love, He is mesmerizing. A moment in time to treasure. I am a lucky gal. yes, Yes, YES (use Meg Ryan's Sally voice)! Add ME! Sign Me UP to be on the SandyBAND wagon!